"It was an excellent evening's entertainment, one of the most memorable moments being the sight of Mr Hurst-Brown, with Machiavellian gown, stalking around his haunted arena in the Ghost's High Noon from Ruddigore.."
"Through the eyes of actor George Grossmith, Tim entertained his listeners with a light-hearted mix of patter songs and solos from the best-loved Savoy Operas. Tim's delivery and diction in the fast patter-songs was faultless and he was most ably supported by pianist Peter Hewitt. 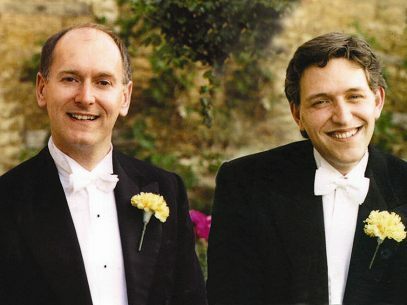 The operetta Fantasias were admirably played.. "
Tim Hurst-Brown began his musical life as a chorister at Peterborough Cathedral, where he trained under Dr. Stanley Vann. Whilst in the choir he frequently broadcast on BBC Radio 3, toured and was privileged to sing at the funeral of Sir Malcolm Sargent. His love of music and the theatre was fostered while he was a pupil at The King's School, Peterborough. After gaining his teaching qualifications from Nottingham University, Tim taught English and Drama for many years, most recently as Director of Drama in an independent school, before turning freelance. Tim has appeared in a wide variety of stage productions, ranging from Shakespeare to pantomime. A Gilbert and Sullivan enthusiast from a young age, he has played almost every leading bass and baritone rôle in the Savoy Operas. Tim has worked with a the members of the D'Oyly Carte Opera Company and performed with former D'Oyly Carte Musical Director Fraser Goulding. Tim is the Artistic Director of The Wandering Minstrels, a highly sought-after concert group who present Gilbert and Sullivan evenings. In 1999 the group recorded Trial by Jury and has plans for a further CD of highlights from the Savoy Operas. The company has, since its inception, raised many thousands of pounds for numerous charities and good causes in the Midlands and East Anglia. The Wandering Minstrels appear regularly at the International Gilbert and Sullivan Festival in Buxton and Tim recently directed a highly successful production of Patience for the Festival. This show, which was staged at the Buxton Opera House, gained Tim the Festival's prestigious award of Best Male Performer. Tim is a very experienced drama adjudicator and examiner, is a frequent speaker and lecturer, and has had many years' experience as a LAMDA specialist. This is the story of Gilbert & Sullivan as seen through the eyes of George Grossmith, the actor who created the comic roles in the Savoy Operas. It stars TIM HURST-BROWN as Grossmith, ably assisted at the pianoforte by PETER HEWITT. Grossmith gives us an insight into both W.S. Gilbert and Arthur Sullivan and enables us to meet the Sergeant of Police, Ko-Ko, The Lord Chancellor, Major-General Stanley et al. THE STORY OF GILBERT & SULLIVAN is a light-hearted evening of stories, songs, poems and music centred on the immortal Savoy Operas. If you are a G&S fan then this occasion is a must!